Some of these differences may simply reflect different social priorities, but others may teach us about the power of different policies. The United States, where roughly one-half or even more of inequality between parents is passed on to children, is often compared with Denmark, where less than one-fifth of income inequality is transmitted between generations. But these countries differ in all kinds of ways that may cloud the degree to which policy makers in one country can adopt lessons learned in another. After all, Denmark could easily fit into South Carolina, with enough spare room to almost fit in another Denmark, and this says nothing about the Danes being a much smaller and less ethnically diverse population, nor about attitudes toward the meaning of the good life. Maybe Danes just prefer a different type of society, and therefore their policy choices are not relevant for Americans? A comparison between Canada and the United States is not as easily dismissed. The Canadian rate of social mobility is roughly twice as great as the American, but the starting point of a study I co-authored with Marie Connolly and Catherine Haeck is that this may be particularly relevant to understanding the influence of public policy because the citizens of these two countries share common values when it comes to the meaning of the “American Dream” and how to achieve it. So maybe the fact that social mobility is greater in Canada has less to do with different social choices based on different values, and something to do with how inequality, which is greater in the United States, influences public policy? A whole host of factors associated with the family and the labour market determine social mobility, but in some measure, the major differences we document between these countries reflects skewed investments in quality education as American communities have historically relied on narrower tax bases to finance primary and secondary schools, with the rich increasingly opting out of the public system. But this in turn is related to another important pattern in our study of Canada-US differences, the fact that the only parallel in Canada for the very low mobility rates of children from the American south is the experience of some indigenous communities, a group that represents a much smaller fraction of the Canadian population. In a paper called “Can you move to opportunity? Evidence from the Great Migration” that is part of her PhD thesis, Ellora Derenoncourt examines the hypothesis that lower end inequality may also be related to race, suggesting that cities and neighbourhoods changed in ways that discriminated against blacks who moved northward during the Great Migration. Her results suggest that access to public goods and schooling became more restrictive, “white flight” depriving these migrants and their children of public investments that in turn had long-term negative consequences across generations. Public policy is an important driver of social mobility, and well-designed policies that are of relatively more advantage to the relatively disadvantaged promote upward mobility and equality of opportunity. Greater inequality, whether it is related to residential segregation or outright discrimination, may move public investments in a regressive direction. These investments certainly include policies like health care and schooling that enhance the capabilities of children, but they also include income support and insurance policies that buffer families from market volatility and give young people a boast as they try to establish a foothold in the labour market and find a partner. Another bottom line of our research is that social mobility can be enhanced by not letting poverty and inequality in the lower half of the income distribution get out of hand. Source: Corak, Curtis, Phipps (2011, figure 8). Click on image to enlarge. 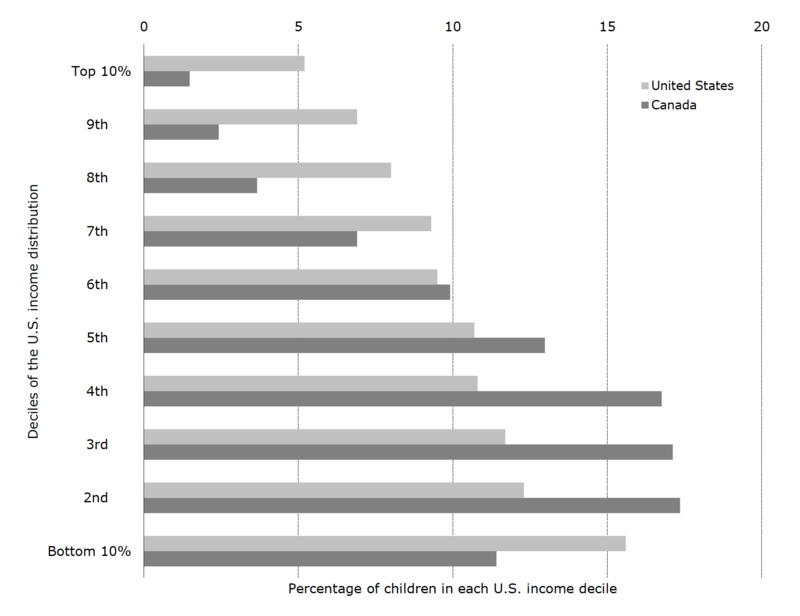 In a related study published by the Russell Sage Foundation in 2011, my co-authors and I showed that if Canadian children who were being raised during the 1990s were placed in the American income distribution, they would be much less likely to land on the lowest rungs of the US income ladder, but also less likely to rank in the top. Children in the United States experience much greater income inequality and higher risks of poverty, and this contributes to lower social mobility. In a paper called “How do the U.S. and Canadian Social Safety Nets Compare for Women and Children?“, Hilary Hoynes of the University of California, Berkeley and Mark Stabile of INSEAD chart the evolution of income support programs in the two countries from the early 1990s to about 2015, documenting significant changes in generosity and delivery. They note that work requirements are a more important objective in the evolution of the US safety net, and that when all programs are taken into account—including state/provincial programs—Canada offers considerably more support to low income families and those living on their own. Source: Hoynes and Stabile (2017, figure 2). Click on image to enlarge. Source: Hoynes and Stabile (2017, figure 3). Click on image to enlarge. But much has changed since 2015, and we have witnessed a continued, and even stronger, divergence in the social policies of these two countries. 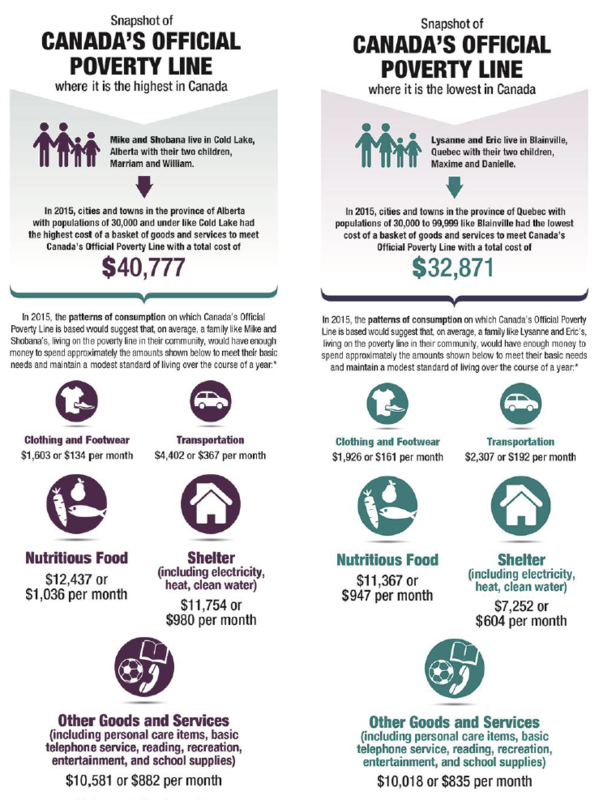 The Canadian federal government is about to pass a “Poverty Reduction Strategy” into law, defining an official poverty rate, clarifying in what ways progress will be measured and monitored, and using it to set challenging yet feasible targets. 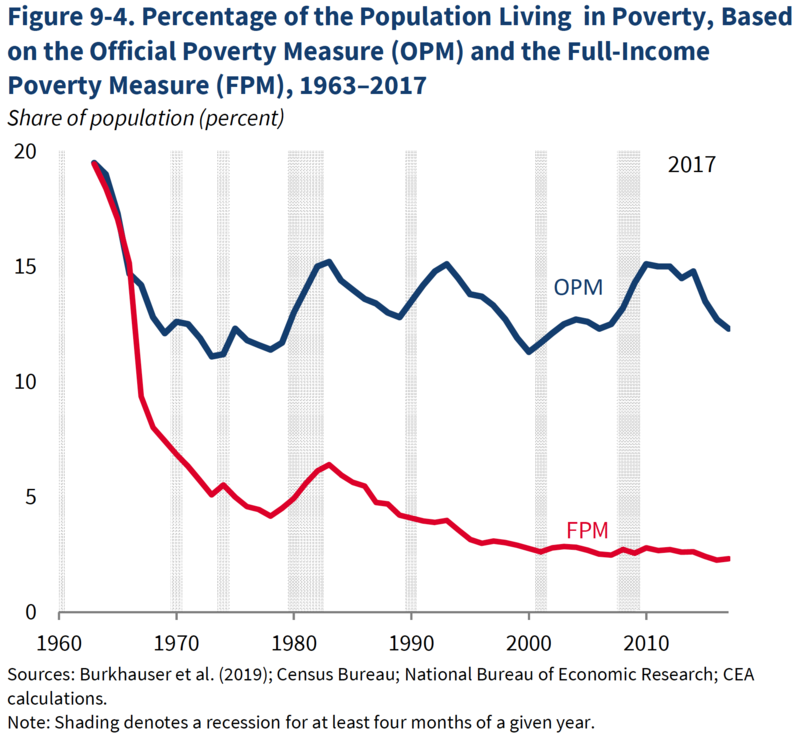 In fact, the overall poverty rate and the child poverty rate have experienced an unprecedented fall since 2015, likely as a result of a series of federal government initiatives. Source: MilesCorak.com using Statistics Canada data. Click on image to enlarge. 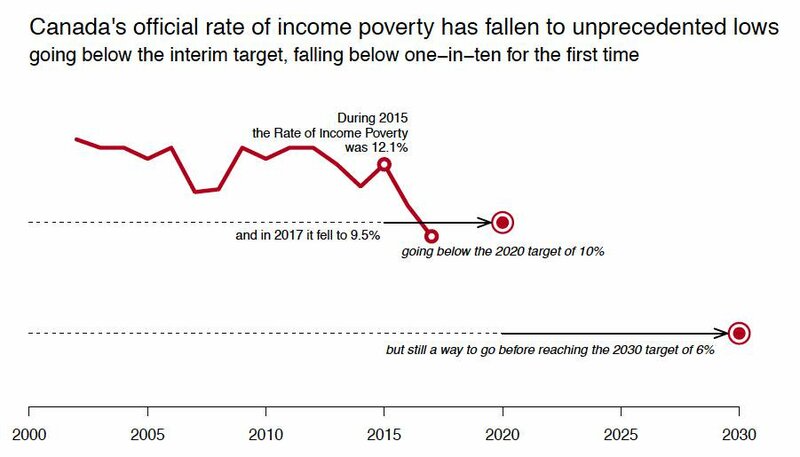 The United States federal government has declared past goals associated with an overly ambitious target to have been accomplished and only of historical interest, while at the same time not clarifying the way to measure poverty and not articulating any clear targets. Source: Economic Report of the President 2019, Figure 9-4. Click on image to enlarge. 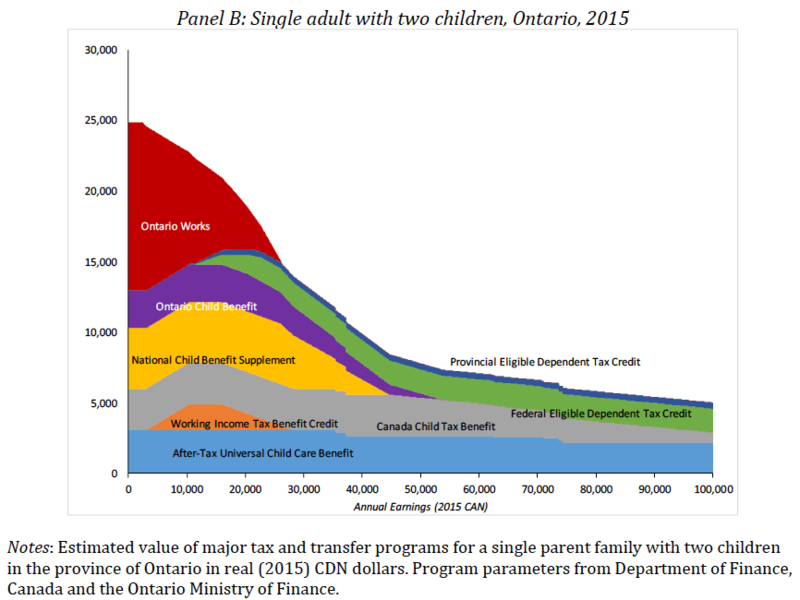 Canada has significantly expanded income support to low income households, supporting families with children through newly designed and enhanced refundable tax credits, the Canada Child Benefit reforming previous programs to be more effectively targeted, more generous, and indexed to inflation. 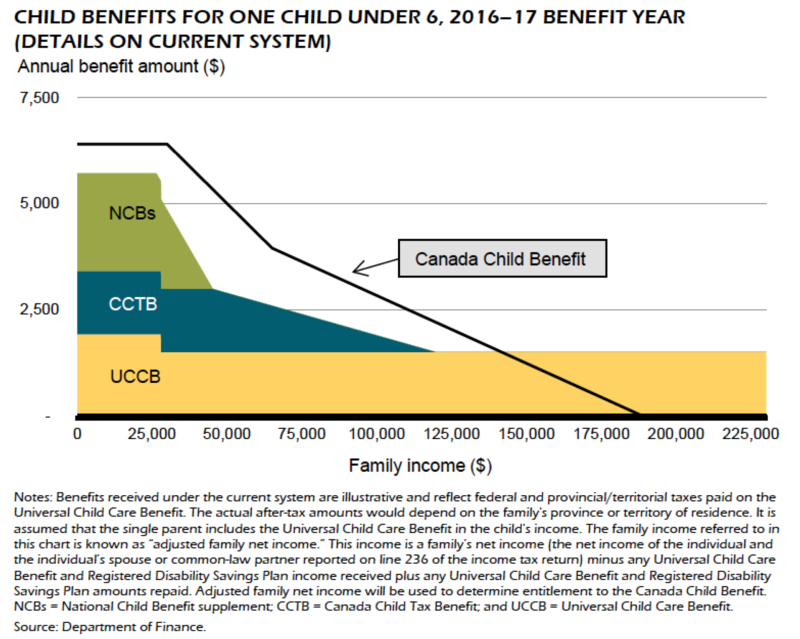 The Canada Child Benefit and what it replaced. Click on image to enlarge. 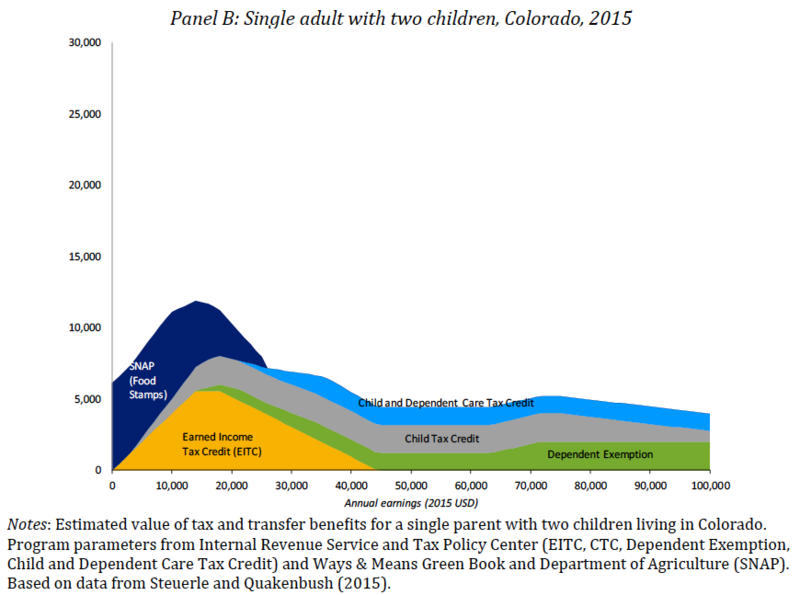 The United States also offers income tax support to families with children but in a way that is much less targeted and not more generous to lower income families. Source: Economic Report of the President 2019, Figure 9-12. Click on image to enlarge. 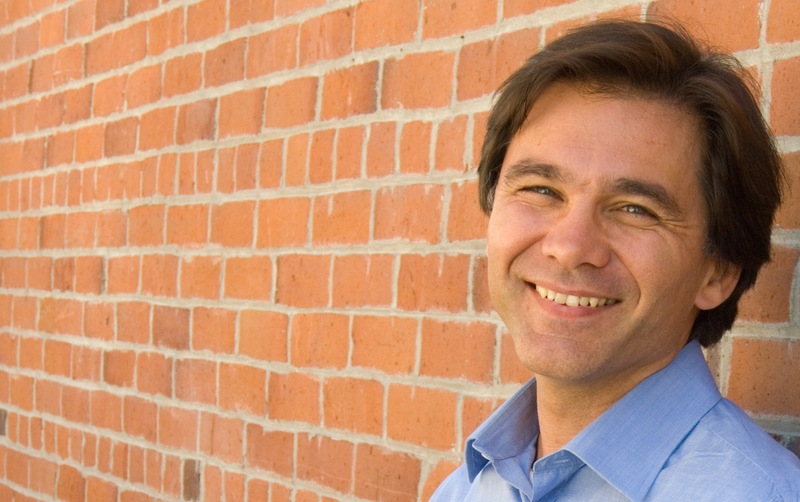 A study by Arloc Sherman of the Center on Budget and Policy Priorities suggests that a Canadian design applied in the United States would cut the child poverty rate by more than half. 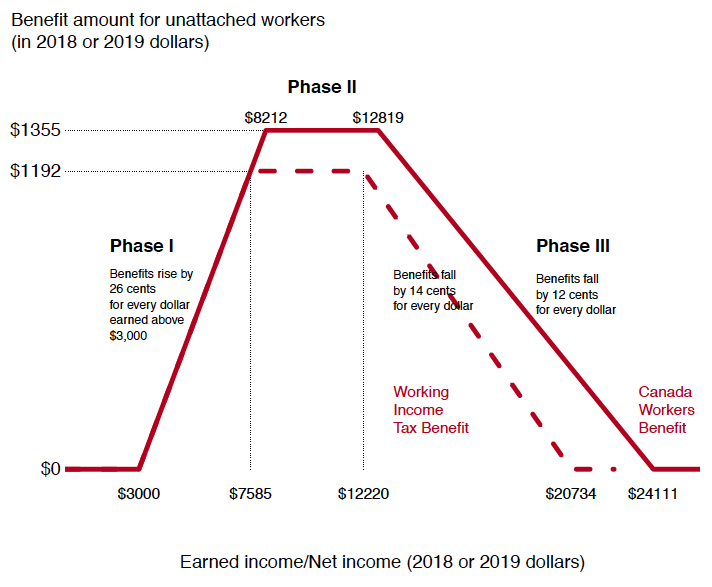 The Canadian federal government has reformed and enhanced wage supplements to low paid workers, including a renaming of the Working Income Tax Benefit to what is now called the Canada Workers Benefit. These payments will also be delivered automatically through the income tax system, not requiring special schedules and applications to be completed. This support includes not just individuals living in couples, but amounts to a maximum of almost $1,400 per year for those living on their own. Source: MilesCorak.com using data from Canada, Budget 2018. Click on image to enlarge. 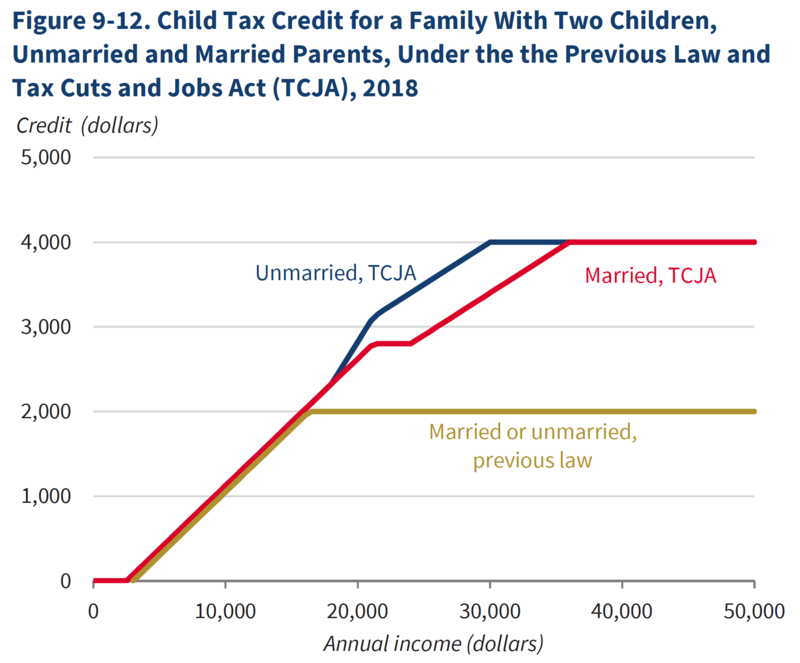 The maximum benefit for couples and single parents is $2,335, which phases out completely at earnings above about $36,500. 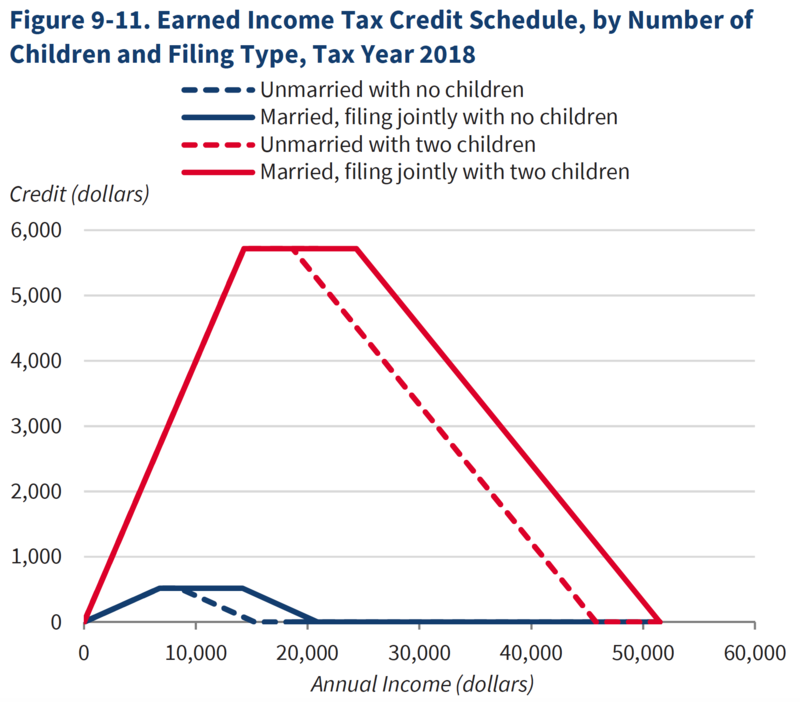 This program was inspired by the Earned Income Tax Credit, the EITC, a longstanding American program that was expanded as a part of welfare reform during the 1990s, a reform that downplayed unconditional income support and introduced work requirements to promote labour force attachment. This is one of the main vehicles delivering income support to families with children and has maximum benefits higher than the Canadian counterpart, but much lower support for singles or couples without children. The administration has no plans to enhance in work income support for these households, which amounts to only about $500. Source: Economic Report of the President 2019, Figure 9-11. Click on image to enlarge. The Canadian federal government has enhanced parental leave through the unemployment insurance program, leaned toward reducing gender inequities in care-giving, enhanced access to higher education along with more income contingent support in the repayment of student loans, and moved toward expanding the health care system through a national pharma care program. It is not a simple task to determine the extent to which all these initiatives will influence poverty and inequality in the bottom half because provincial/state and municipal governments also play a role. (Hoynes and Stabile offer an assessment based on information up to about 2012.) But it is clear the Canadian and American federal governments are leaning in very different directions. This is also clear in policies that impact inequality at the top. The Canadian federal government has raised the marginal tax rate on the rich, introducing an extra tax bracket for the top 1 percent, and more recently closed some loopholes associated the the preferential tax treatment of stock options and capital income. The US federal administration has cut taxes through the Tax Cuts and Jobs Act in a way that some estimate will be of disproportionate benefit to the richest Americans, and likely to increase federal deficits and limit future spending. Blue line represents United States; red line, Canada. Click on image to enlarge. 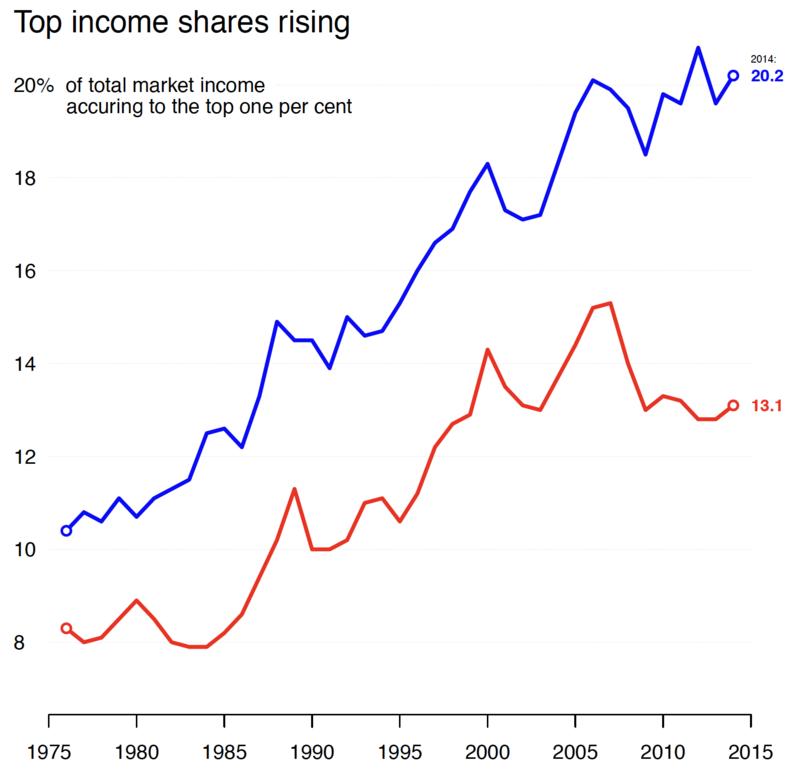 Top end inequality has grown in both countries, but more so in the United States with the top one percent taking home about one-fifth of total market income in the United States, significantly more than in Canada. Other studies of social mobility show that there is only a weak—if any—correlation in top income inequality and upward mobility both within Canada and within the United States. But what this misses is the potential influence the top one percent has on the conduct of government, implying that the impact of their preferences on public policy may be much greater in the United States. Inequality is a choice, and as a result so is equality of opportunity. What a well researched & insightful set of articles. Thank you. I wish it were “required reading” for U.S. politicians, newscasters & general public. Alas, the pervasive attitude in the U.S. is that, “the poor are poor because they’re lazy & don’t want to work hard to support themselves”. By & large, that isn’t the case; there are very few to whom that may apply. This attitude has been 3 decades in the making & is unlikely to change. Public policy would need radical changes, but the will to do so is “trumped” by political paralysis. The bottom line is that the U.S. does not have the same values that once made this a great nation. Greed, not compassion, or equality, has taken hold. The country is now run by & for, the “uber-rich”. The bulk of Americans are still trying to achieve “The American Dream” – but now that involves more debt. This is also the group that’s forced to pay the taxes to support government. That leaves those working so hard to stay “middle-class” (+ the small/medium size businesses) to carry the tax burden. They’re being squeezed & understandably, resent it. But, blaming the poor is NOT helpful…except to politicians & wealthiest few, who refuse to pay into the very system that made them so very rich! ~ Ya’ know what? Forget, “compassion for the less-fortunate among us”, for a moment. Take emotions out of it…cold, hard facts only. A shrinking American middle-class CANNOT support the U.S. government. It is not economically sound, nor sustainable. And “blame” doesn’t pay the bills. (In a country making war all over the world, who CAN afford it?! But that’s a different issue.) Economic mobility just makes sense. Lift people out of poverty! Give them the advantage they need to become productive members of society, able to make a living & contribute to it, in order to continue providing what is needed to lift others up as well. You need a much larger group of people earning decent wages, in order to have more taxpayers sharing the burden of paying for government. More people able to pay into it = less taxes per person. IF YOU WANT TO PAY LESS TAXES, THERE NEEDS TO BE MORE TAXPAYERS ABLE TO SHARE THAT BURDEN WITH YOU. In order to do that, government MUST invest in its own people & country. Is that all it takes? No ~ but without that, nothing else is gonna’ make change for the better. Hard choices to be made in the U.S. — due to decades of poor choices! The current administration is NOT ABLE to make choices necessary for benefit of the people & country, as a whole! Ignore the rhetoric & demand changes & a plan to get there. It’s now or never! “It ain’t rocket science”… it’s math & logical thinking. Don’t have to do it out of compassion for others — do it for self-preservation!